National Geographic on Tuesday aired an episode of its series 'The Story of God' that was shot in Kenya last year. 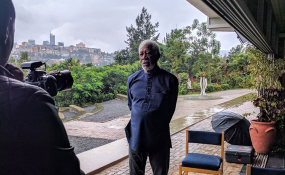 The series, narrated by Oscar award-winner Morgan Freeman, explores how religion has evolved and shaped societies across the globe. Freeman was in Kenya last year to shoot episode three of the series and interviewed Dr Charles Mulli, the founder of Mully Children's Home and a celebrated social entrepreneur. The episode it titled 'Visions of God'. "In some places I found answers, and others led to more questions. The constant through it all is that we're all looking to be part of something bigger than us. If there's one thing I've learned, it's that we certainly are," Freeman said in a statement. Before appearing on the series, Dr Mulli's visions of God were also extensively covered in a movie, 'Mully', released in October 2017 and directed by Scott Haze. 'Mully' is a story of Dr Charles Mulli, an orphan who through hard work and faith in God became a millionaire. Reflecting back on his life, he decided to dedicate his entire life to saving and caring for orphans, street children, destitute, neglected and other needy children.